I am thrilled to introduce you to Julia, a talented designer that stands behind the blog Garmenter, which has a rather interesting business concept, the one you won't see often. You see, Garmenter sells basic sloper patterns, which can be used for further pattern alterations and making your custom designs. Moreover, the patterns aren't printed on a paper, but on a muslin fabric, so that you can directly cut the pattern from the fabric and make the sloper according to your measurements. 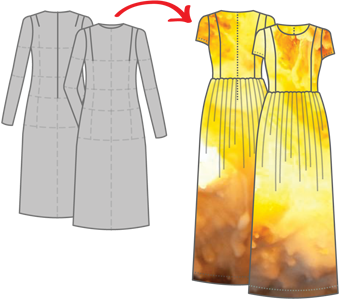 Once the pattern is fitted and adjusted to your body, you can use it as a basis for drafting your own patterns, or you can follow the great instructions given on the Garmenter site, that guide you through drafting various models. So, not only do you get the sloper pattern, but you also get great pattern drafting lessons and help with fitting and adjusting the pattern. The Madeleine dress and i Aleksa skirt are just some of the many models you can find on Julia's blog, so I advise you to visit her website and learn more about her ideas and perhaps learn some new techniques. 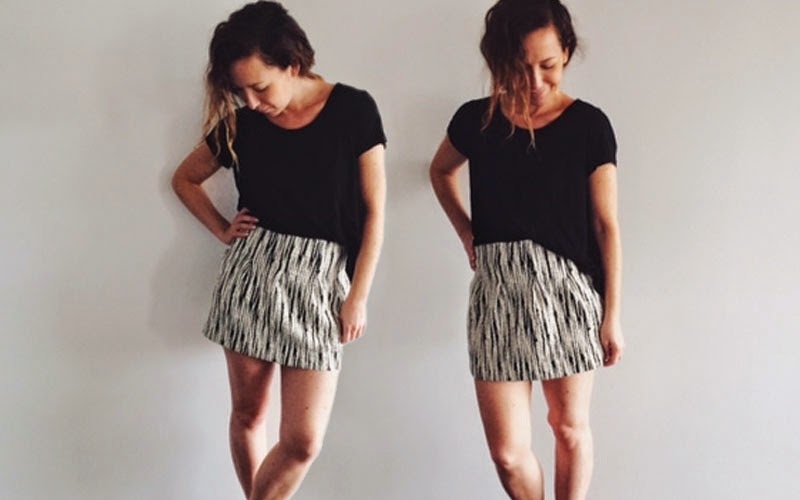 Julia was kind to share with you a great tutorial for making a mini pleated skirt, which can be made wihtout a pattern! She says she was inspired by my Zlata skirt, which makes me feel flattered. As a part of Sewing Indie Month, I have the honor of crashing wonderful AnaJan’s blog for the day with a tutorial of my choice! So I thought I’d do a very simple skirt tutorial inspired by Stepalica’s Zlata Skirt, but for which no pattern is needed. All you’ll need is about ½ m of a somewhat thick knitted fabric (I searched and searched for a good neoprene fabric, but eventually had to give up), matching thread of course, 3 cm wide elastic to go around your waist, and all the usual bits and bobs necessary for a sewing project. 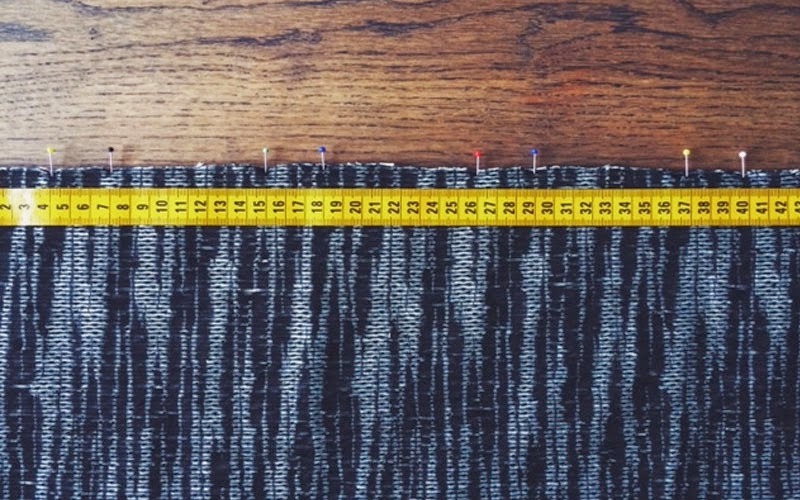 The waist measurement (x), which is where you want the waistline of your skirt to be placed, minus around 3 cm to account for the stretchiness of the knitted fabric, and plus 30 cm for the fullness in the bottom. It’s these 30 cm we are gonna remove with pleats later on. And the skirt length (y), which is simply the length between the waistline and the place on your thigh you want your skirt to end, plus 4 cm for the hemline seam allowance. 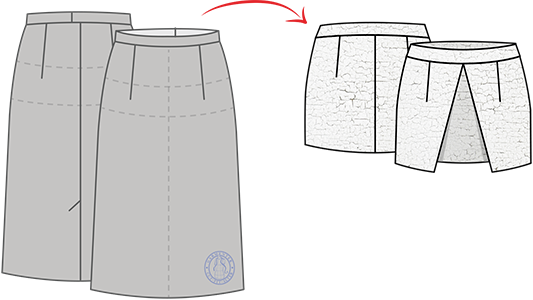 The job of the pleats in this design is to remove the 30 cm we added on the last step, but only around the waist, and in an evenly distributed manner around the waistline. In this case, the fold of our pleats will be of 3 cm, giving us 10 pleats to work with. But before we do that, we need to figure out the distance between each pleat, and for that we need our good ol’ friend x from last step. All you have to do is divide x by the amount of pleats we’re doing (10 pleats, that is), and you have the distance between the pleats (or what we hereafter will be calling “z”). So: x / 10 = z. Now, lets put the pleats in place! Since this is just one big rectangle, it will only have 1 seam holding it together, and that seam is the CB seam (“center back”). This seam however, will be placed between 2 pleats, so that the distribution of these isn’t affected. This means that on each end of the rectangle we will begin with a half z (or “z/2”) rather than a whole z. This way it will be like a whole z once the CB seam is sewn together. As we determined before, begin with a z/2 on one side of the rectangle. 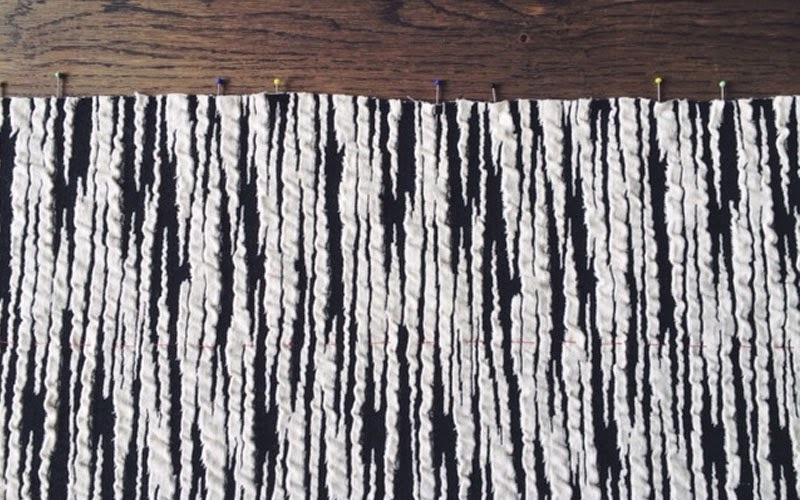 Follow that with a pleat of 3 cm, and then continue with a full z. Continue this way until you have 10 pleats, and end it with another z/2. * I simply used pins to mark where each pleat should go. 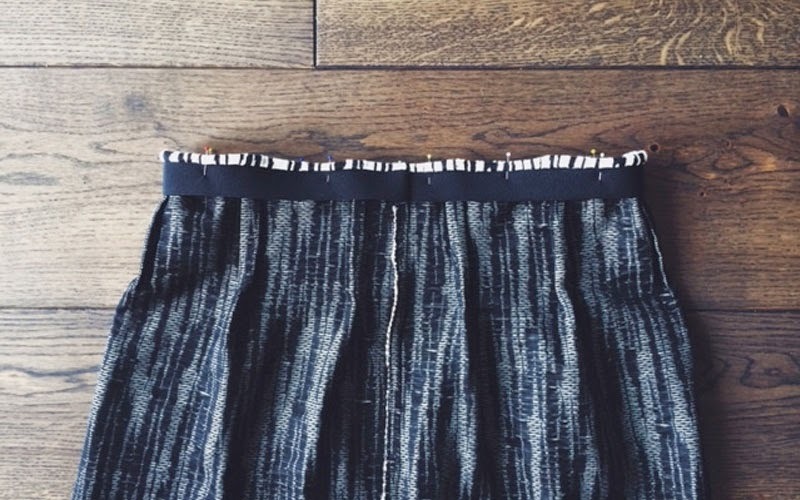 To know where the pleats end, or in other words where you should stop sewing the pleats closed, sew a horizontal basting stitch between 12-15 cm from the waistline. On you ironing table, press each pleat shut following your distribution from step 2, and pin them in place as you go along. Once all the pleats are pressed and pinned, stitch vertical straight seams from the beginning of the pleat to the basting stitch. Of course remembering to backstitch at both the beginning and ending of you seam. Here you can choose what kind of pleats you want. You can either press them as they are toward one side or the other, or do like me and press them open like box pleats. Anyway you choose, fasten each pleat with a pin as you press them. Since we’re working with knitted fabric, we need to somehow make sure that our skirt stays put around our waist and doesn’t just slide down our thighs. This we’ll do with some trustworthy elastic. So, take a wide elastic band and attach it to the right side of the waistline using a serger or overlock, or just a good old zigzag stitch. Before we finish up on the waistband, close and press the CB seam using the same stitch as with the elastic band. 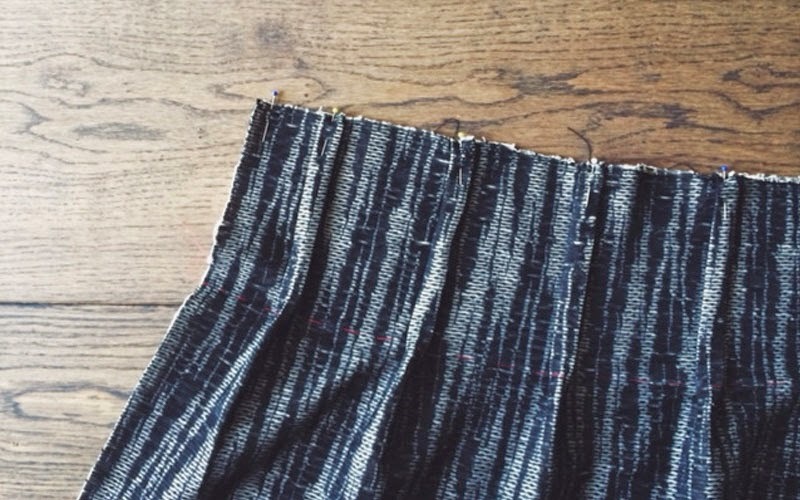 And for the waistband, there are just 2 steps to follow. 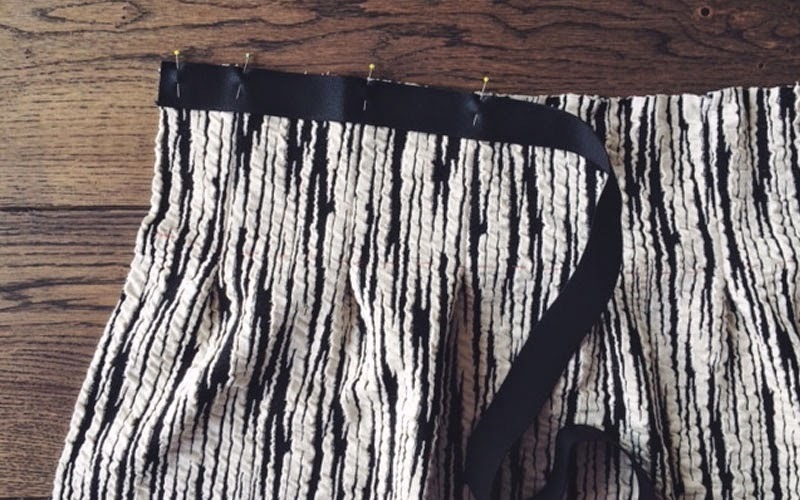 First, turn the elastic band toward the inside of the skirt, and fasten it with one pin between each pleat. Second, from the outside of the skirt “stitch-in-the-ditch” on every pleat seam to fasten the elastic, without it showing on the outside. “Stitch-in-the-ditch” means that you carefully sew 2 or more layers of fabric together by carefully stitching exactly along a seam. And all that’s left now is the hemline, where an invisible stitch would be the classiest way to go I think. 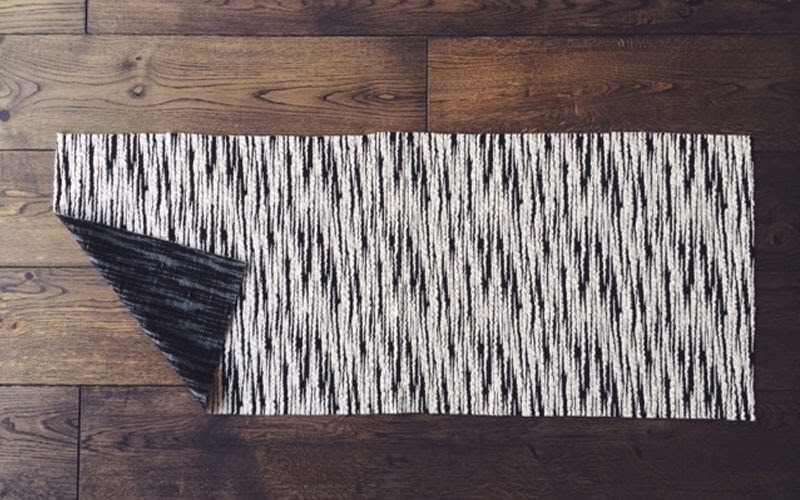 Otherwise, the way to do knit hemlines usually is a twin stitch, which gives a more sporty finish. Hope you enjoy, and happy Sewing Indie Month!